Digitalis laevigata is a rare foxglove species native to southern Europe. 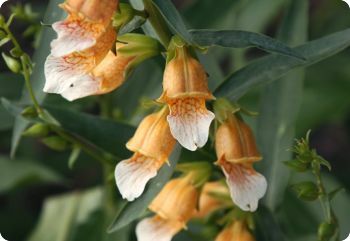 It has soft orange-yellow flowers with purple netting and a white lower lip. I think that Digitalis laevigata should be more widely grown. The flowers are unique, and it's a reliable perennial for part shade. Also known as Grecian Foxglove and Giraffe Foxglove. Deer resistant. Hardy in zones 5-9.